The Hovell Tree commemorates the exploration and naming of the Hume River (now the Murray) by Hume and Hovell`s expedition of 1824. In 1824, Governor Brisbane asked Hume to join forces with an English sea captain, William Hovell, to go from Lake George to the Spencer Gulf in South Australia. 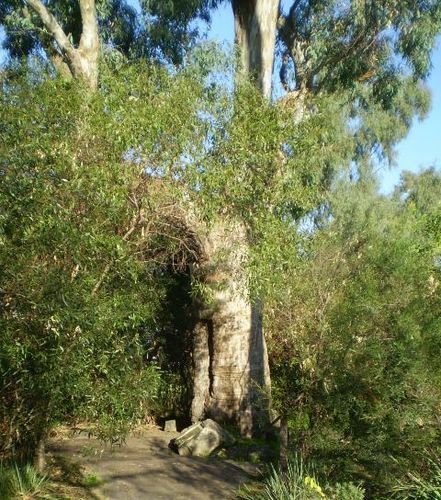 The Hovell Tree, marked by the explorer on November 17, 1824 was flanked by another tree marked by Hamilton Hume which was destroyed by fire in the 1840's. The river gum was marked by William Hovell when discovering the Murray River. Hume and Hovell travelled from the Yass area and after crossing the Murray River where Lake Hume now is, they crossed the Mitta Mitta River and proceeded to Corio Bay, Westernport.